As part of our mission, the Friends of Indian River is encouraging residents of the our neighborhood to join the Elizabeth River Project's River Star Homes program. In this effort resident pledge to take "7 Easy Steps" to help improve the quality of our neighborhood, our river and the Chesapeake Bay. Your home does not need to be facing the river to participate! Everyone's actions affect the cleanliness of the river and its ability to support fish, birds, and other wildlife. And since your efforts start in your backyard, you are also creating a healthier environment for your family. 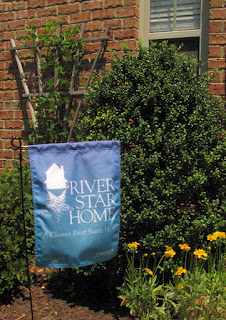 Every extra home that signs up brings us one step closer to the goal of vibrant community with a healthy environment. By signing up for this free program, you will be recognized with a handsome yard flag and will receive additional information about things you can do to help. Sign up via the link below. If you do sign up, it would be great if you let the Friends of Indian River know too: drop us a line at info@friendsofindianriver.org. At our last meeting we had a lively discussion with Ms. Helen Kuhns, Education and Outreach Coordinator for Lynnhaven River Now, about how Lynnhaven River Now got started 10 years ago and steps they took to be successful. As our Outreach Committe co-chair wrote me afterwards "Dream Big and Set Clear Objectives". And, thanks to the enthusiam of our volunteers and members, the Friends of Indian River have certainly set off on a road with ambitious goals. Covering the northern half of the City of Virginia Beach, the Lynnhaven River watershed was once world known for its oysters. But as the city's population exploded in the 20th century and land turned from farmland to suburbia, the water quality suffered dearly. In 2003 a small group of local residents got together to rally the community to reduce pollution in the Lynnhaven River Watershed. They worked to mobilize public and private resources to foster improvements. That original core group has now grown in an award winning organization with over 3000 members called Lynnhaven River Now. Through their efforts sizable expanses of the Lynnhaven have been re-opened to oyster harvest, land has been preserved from development, and community awareness has been raised. The Indian River watershed is only a tenth of size of the Lynnhaven, but we share many of the same concerns. At our next meeting, Helen Kuhns, Education and Outreach Coordinator for Lynnhaven River Now, will come to speak to us about how Lynnhaven River Now got started and their keys to success. Please join us on June 14th at 7 pm at the Oaklette United Methodist Church for this interesting presentation. We had a great time for our Clean the Bay Day Event today. Twenty volunteers of all ages came out to help make a dent in the trash and debris that has collected over the years around the Indian River Bridge. One team tackled each end of the bridge and were soon working their way into the stands of phragmites to pull out the assorted flotsam and jetsam. Two canoes plied the shoreline picking up harder to reach items. We had several new volunteers come out and join us today. Our canoeists also made friends with the commercial crab boat that works the river and supplies some of the crabs to Wickers. We were amazed at some of the items we found - clothing, blankets, venetian blinds, a teddy bear. There were also parts of an old bicycle, some tires, rugs, and a vacuum cleaner. There was also an unfortunate amount of broken glass under the bridge. Of course, there were lots of plastic bottles netted by the phragmites. I doubt anyone who works on such a cleanup is ever careless about littering again. All in all, we collected about 40 bags of trash, and a lot of debris that didn't fit in bags - from rugs to lumber. We estimated the weight at 1000 lbs of trash and, including the area covered by the canoes, we cleaned about half a mile of shoreline. That's a whole lot of trash that won't sully our shorelines or be ingested by wildlife. Thank you to the City of Chesapeake for sponsoring the event and providing trash bags and other supplies. Kudos to Tanner Council at the CBF for some last minute logistical support. And especially, a really huge Thank You to all the volunteers who came out today and did the really hard work of digging out trash and making our community better.